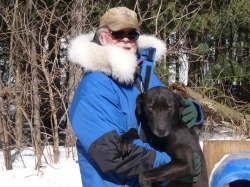 "SLED DOG SCHOOL BEGINES IN THE NORTHERN FOREST!" The pups are now 9 months old and are starting their training to become Sled Dogs. First, they are staked out at the truck and away from the security of their houses. Next they are walked on a leash, allowing them to go and explore what ever they want. As they get comfortable with the leash and start pulling on the collar, the harness is placed on them. When they get used to the feel of the harness, the leash is attached to the tug loop at the back of the harness. When the pups start pulling in the harness, the first lesson is over and they get a snack of a piece of frozen fish as a reward. The dogs were introduced to a modification to their diet with the addition of more fat to increase their energy and stamina. the running team were also introduced to the new training schedule of three outings per week. This coming week, hopefully, we will see an increase in their overall speed. It was a beautiful week here weather wise with plenty of nice sunny days.